Most of the body is now shaped, but a couple more areas I like to touch. 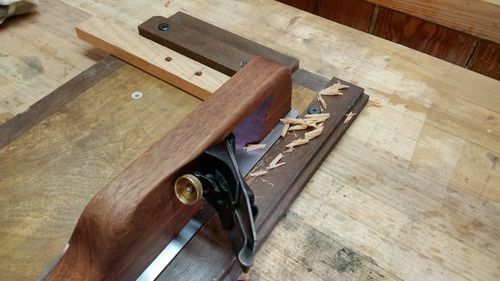 The corner of the 3/8 base plate is still at a 90 . . . .
. . . . so I round it to match the wood body and eliminate a sharp corner. I also round over the top of the escapement area a bit to eliminate that corner, as well. No picture of what it looked like, but these are the areas that get some attention. Now it’s just a matter of sanding everything to whatever level you desire. Don’t forget the metal around the mouth, where it gets scratched by the files when working the mouth. 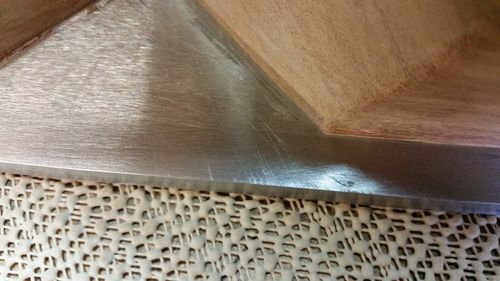 I sand both the wood and metal up to 180, taking into account what direction I want the scratch pattern to be on the metal. You’ll also want to make sure to knock down any sharp metal edges with a couple sanding passes. 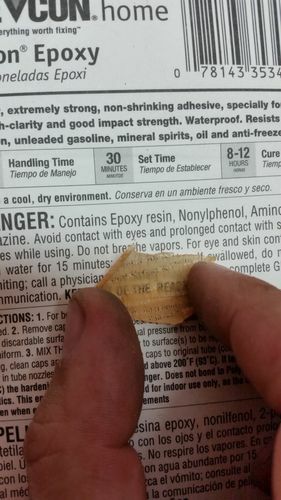 Make sure to use different pieces of sandpaper, though, or you’ll get black metal dust into the grain of the wood. If you want a fully polished look on the metal, feel free, just know that the unhardened O1 will scratch very easily. That’s one of the reasons I keep it with a brushed look. Once finish is dry, everything gets a coat of wax and the plane can be assembled . . . 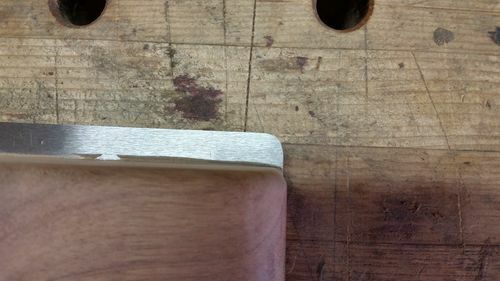 Sometimes, shooting end grain just gives dust, but if you are getting shavings, then everything is definitely working correctly. Especially if they are see through. Whew! That’s it, we’re done. It’s quite a bit of work, but there is definitely a satisfaction to using tools you’ve made yourself that can’t be matched. 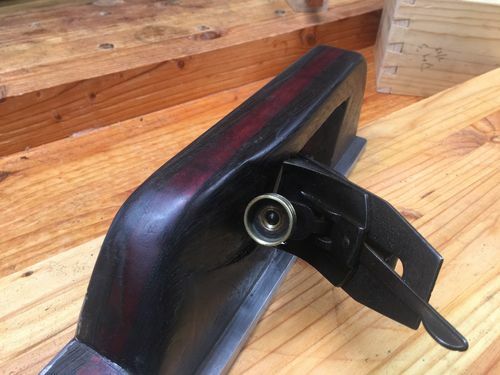 Hope this blog series helps some of you that wish to build your own shooting planes. If you have any questions at all, please feel free to post them in the comments and I’ll answer what I can. If you do build one, please post it as a project. I’d love to see what variations others come up with. Thanks Jay. I finished mine up today. I had it mostly done yesterday. Made some mistakes so it won’t be the final one I make but it works but not as good as yours so I need to fine tune it. I get mostly dust on end grain so I have to tinker. Finished my shooting board today but will add a finish to that tomorrow. I needed a board that matched just because right? Jay, thanks for the great blog. Now I know enough to be dangerous. One question, did you ever consider a handle like the 51? When I build the very first one last year, the original plan was to add a tote. Once I started building the plane and saw how the thickness of the body could accommodate the hand, I scrapped the tote. I like the cleaner lines and it works really well as is. If someone wanted to add a tote, no reason they couldn’t. Thanks Jay. I finished mine up today. I had it mostly done yesterday. Made some mistakes so it won t be the final one I make but it works but not as good as yours so I need to fine tune it. I get mostly dust on end grain so I have to tinker. Cool, can’t wait to see it. There were plenty of mistakes on my prototype. The one sent to Terry went better and this one even better (though there were still challenges to overcome) because of learning from the first two and thinking things through a little better. 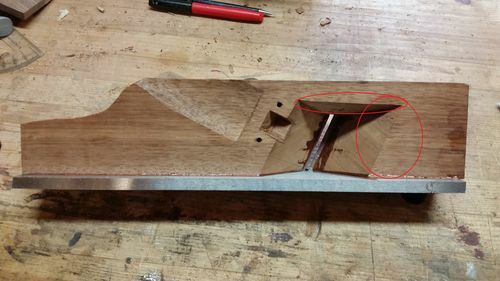 Mistakes are a part of woodworking and attempting new things, just a matter of how well you recover from them and still make the plane work. The whole reason for writing this blog was to try and help someone else avoid some of the mistakes I made the first time because of not having any guidance. If you are getting dust, two thing to check. First, are you sharp enough? 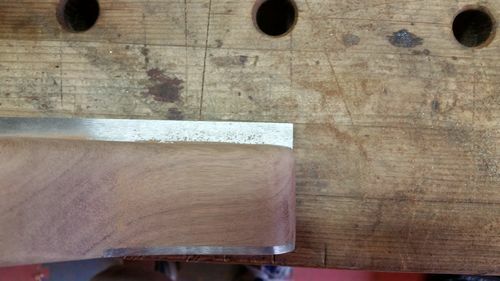 An edge that is not really sharp will only create dust instead of shavings. If you are sure the iron is sharp, try a different piece of wood. 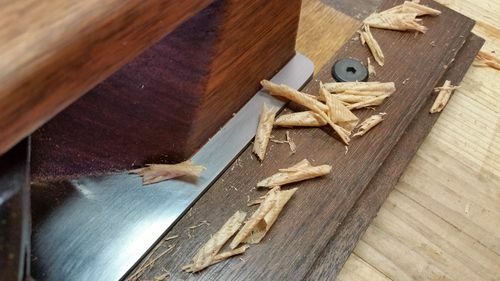 Some pieces just don’t give end grain shavings. 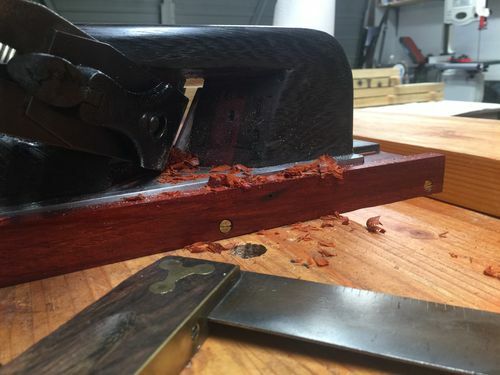 The jatoba used on this plane won’t give a good end grain shaving, no matter what I try. Whether that’s the grain structure of what, I don’t know for sure, but it happens. I was using some really dry cedar that I had just sitting around. I think it’s moisture content is in the negatives. I tried pine and got little shavings, smaller than yours but shavings at least. I’ll still fettle more. Looks good, can’t wait to see the full project post. I can feel you on the cedar. I was using some western red cedar on a project not that long ago and it never gave shavings, just dust. Ok, couldn’t resist going out and getting it done so I threw some boiled linseed oil on the shooting board last night and looked good this morning. In Arizona all dry time are generous. I fetters with it a bit and got isome shavings. I decided my pauduk was good to use since I just bought the stuff a few weeks ago and it was hard/wet enough for shavings. The new board is sweet too, it fits like a glove. I’ll take more pics and post in that project section tonight or tomorrow. It’s got lots of mistakes, it’s kind of ugly, but it works and cost about half the price of a used 62 from eBay. You started this, ill of course be giving you full credit on design and plans. 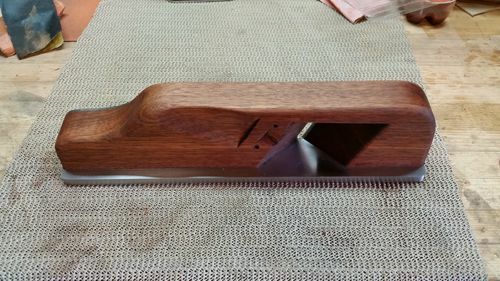 This is kind of cool, my first homemade plane too. WOW Jay, seriously cool blog, probably my favorite. I’ll build one sometime and will post it (as I do, you may get some pm questions from me if you don’t mind). Gotta get my shop and bench finished, I’m slow so it will be a while. Project posted. Thanks again for the help JayT. Thanks for the write up JayT. When I get time next year, I’m going to give this a try. 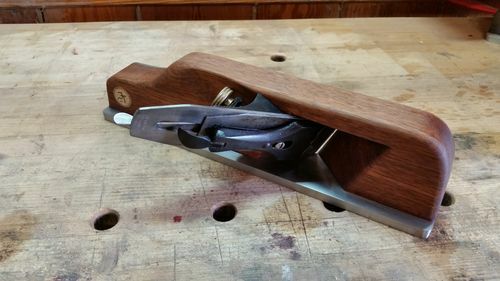 Really nice work – - Bridge City Tools has competition! !